This was a premium from Post Cereals. A certain number of proofs of purchase were needed (not boxtops: these were cut from the side of the box) plus a small handling fee. That was sent to a post office box in Kankakee, Illinois. 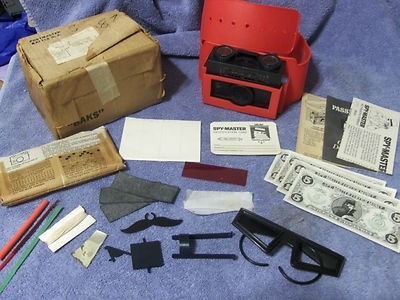 The Spy-Master Kit was similar to the James Bond 007 toys seen on this list. Except instead of the case this came on a belt.